I’ve read this book at least 3 times now, but it’s really cute. I don’t mean cute as in “quaint” but rather cute as in it has really appealing graphics and a fun storyline. It’s meant for young adults, so that’s part of the “cute” factor. In the meantime, the story has some really interesting things happening on the level of plot and theme.You’ll notice that I categorized this book as magical realism. I think it’s a borderline classification, but toward the end of the story when (plot spoiler!!) the Monkey King turns out to be Chin-Kee, and Danny turns out to be Jin, and Wei-Chen turns out to be the Monkey King’s son…well, let’s just say the lines between cultural mythology, contemporary life, and what appears to be a sitcom get blurred and suddenly things that seemed like supplemental stories taking place in spaces outside of Jin’s reality turn out to be Jin’s reality. Of course, I loved this. Go figure. :)Also, I thoroughly enjoyed Yang’s sense of humor. Every time one of the Asian American kids gets introduced to their classmates, the teachers mispronounce their names (for instance, Wei-Chen Sun from Taiwan becomes “Chei-Chen Chun” from China, and Jin Wang from San Francisco becomes “Jing Jang” from China). 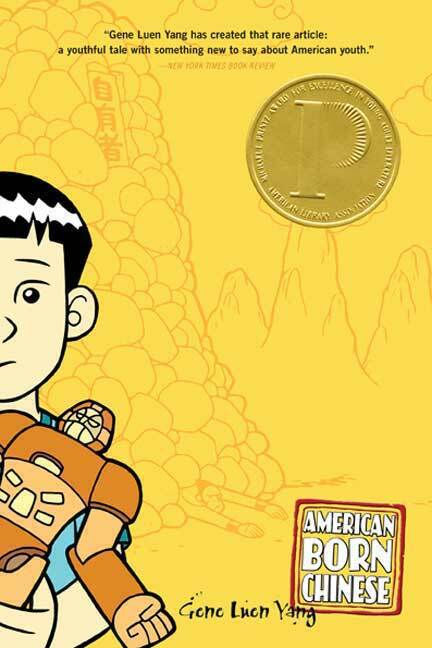 It’s just so true to life that it’s hilarious, and the poor kids are just so jaded about such introductions and misconceptions that I actually laughed out loud.Yang’s graphic novel is a really interesting work, and is quite complex — so even adult readers can enjoy it despite the fact that it was written for a young adult audience. If you happen across this one, pick it up and give it a read!